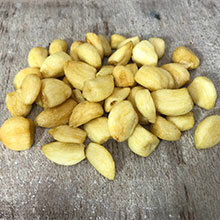 Whole garlic cloves are vacuum-fried, resulting in a wonderful, crispy snack. Garlic Chips are great to eat on their own or on a salad instead of croutons. Price is per pound.